A trip to Idaho gives you an up-close glimpse of the West's vast landscape and its historical past. About two-thirds of the state's land is publicly owned, with a great portion set aside as wilderness or deemed specific for recreational use. Within Idaho lies some of the most majestic lakes, rivers, mountains, and forests in the world. And while it would take a long trip to explore all of the state's offerings, activities like skiing, rafting, scenic driving, and hot springing will keep you busy in almost any region between Hells Canyon and the Teton Mountains. Sun Valley's year-round outdoor recreation and awesome mountain scenery draw visitors from around the world. But the resort town is best known for world-class downhill and Nordic skiing. In the winter, you can also enjoy snowshoeing regional trails or heading into the backcountry on a snowmobile. Sun Valley hosts special events and festivals throughout the winter season. And nearby Ketchum offers great hotels and lodging options, along with all the services to support vacationers, including amazing dining, shopping, and entertainment. Located in northern Idaho, Lake Coeur d'Alene is long and winding, with miles of forested shoreline, sandy beaches, and a myriad of coves and bays. This watery playground attracts for waterskiers, wakeboarders, fishermen, and paddlers. Several seasonal outfitters rent both kayaks and SUPs (stand up paddleboards), great for cruising along the shoreline looking for the perfect hang-out spot. The city of Coeur d'Alene, at the north end of the lake, offers great restaurants, unique lodging, and wonderful town parks. Take advantage of The Coeur d'Alene Resort's facilities and services, which include a full-service spa, a world-famous golf course, and a selection of restaurants. The 115-mile Sawtooth Scenic Byway follows State Highway 75 through central Idaho and some of the wildest forests in the country. The route parallels the ridge of the Sawtooth Mountains, passing through the towns of Shoshone, Hailey, Ketchum, and Sun Valley. Experience abundant wildlife sightings, canyon and river crossings, and picnics at a high mountain lake. Put stops at Mammoth Cave, Sculptured Canyon, Galena Summit, and Redfish Lake on your itinerary. Idaho's sunny summer weather, devoid of humidity, provides the perfect atmosphere for golf. And you can get your game on right in the shadow of the Teton Mountains, directly "over the hill" from Jackson Hole, Wyoming. The Headwaters Club at Teton Springs Resort offers an 18-hole course, a 9-hole par 3 course, and a driving range. Wake up early to the view the occasional moose of deer munching on the green, then retire to the Stillwaters Spa for a muscle-relaxing après treat. 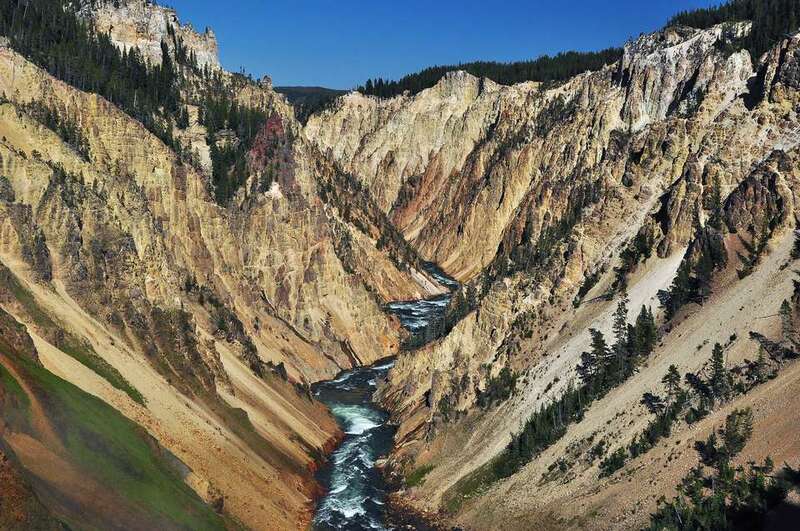 It's a great stop if you want to loop in Wyoming's Yellowstone and Grand Teton National Parks, too. Ancient lava once flowed through the plains of central Idaho, and then it dried creating interesting topography as well as a home for rugged plants and wildlife. A visit to Craters of the Moon National Monument and Preserve lends a look at the remarkable lava landscape. A loop drive takes you through a portion of the national monument, with frequent places to pull over and explore cones, craters, and caves. Hikes range from 100 yards to 8 miles in length. In the winter, Craters of the Moon trails offer great terrain for cross-country skiing and right outside park boundaries is a soakable roadside hot spring. Peruse an interesting variety of history or science exhibits at The Museum of Idaho. Permanent exhibits include "Eagle Rock," with artifacts and information related to regional life in the 1880s, and "Race for Atomic Power," which chronicles the region's contributions to the field of nuclear energy. The Museum of Idaho also offers an ever-changing series of traveling exhibitions, covering topics like the human body, the Lewis and Clark Expedition, dinosaurs, and insects. Hells Canyon, the deepest river gorge in North America, can be experienced in a number of ways. And while many people take it all in by jet boat, the most pristine way to immerse yourself in this remarkable waterway is on a raft. Local outfitters run trips out of Riggins or Cambridge that include multi-day floats or quick whitewater excursions. And if you don't have time to float it, make way into the Snake River by hiking, mountain biking, or horse packing. The lands of Hagerman Fossil Beds National Monument are home to a significant concentration of Hagerman Horse (Equus simplicidens) fossils. This Ice Age mammal populated the grasslands of North America before going extinct approximately 10,000 years ago. Before you go, stop at the visitor center in the town of Hagerman, Idaho, located one hour southeast of Boise. There you'll learn about the other unique fossils found on the ground like the giant otter (Satherium piscinarium) and several Pliocene birds. You can enjoy hiking, boating, hunting, fishing, and horseback riding nearby the monument. Idaho's capital city of Boise is a recreationist's haven. And its popular greenbelt trail makes it easy for residents to get to and from work, as well as sneak in some mid-day exercise. As a visitor, the 25-mile Greenbelt Trail will give you a good glimpse of both the beauty and vibe of this trendy western town. Follow the river through the heart of downtown, pop into a coffee shop along the route, or frolic in one of Boise's beloved city parks. And if you're more into a leisurely cruise, rather than a high-energy pedal, rent an e-bike for the day to tour the city's greenspace. On the western flanks of one of the biggest volcanoes on earth (Yellowstone National Park), Idaho is home to several geothermal features that reside underground. This energy stockpile makes itself known by several hot and mineral spring situated throughout the state. Backcountry and road-side hot springs are a purist's dream (and most are clothing optional), but commercial hot springs, like Miracle Hot Springs on the west end of the state and Heise Hot Springs on the east, get you into restorative waters without the effort of a trek. You can't leave Idaho without seeing what some travelers refer to as "The Niagara of the West." Shoshone Falls, one of several waterfalls along the stretch of Idaho's Snake River, sits at 212 feet tall and 900 feet wide. It's one of the largest natural waterfalls in the country and surpasses the height of Niagra Falls. Head to Twin Falls, Idaho in the late spring, when snowmelt from the Tetons and surrounding mountain ranges make its way into the majestic river canyon and over the falls. From the overview, which is hundreds of feet away from the falls, you may even get splashed in the face.